Attractive guncase in top quality pigskin. 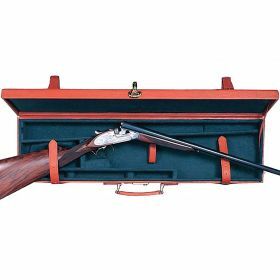 The case has compartments for stock, barrel, forend, tools and cleaning kit. It is lined in soft felt, has two straps and buckle closures and brass lock. Over and Under - Dark Brown only - L 32" x H 8.5" x W 3.5" and will accept a maximum of 30" barrels.